Can't see your fridge for the artwork? Extend your gallery with magnetic wallpaper! Can’t see your fridge for the artwork? Extend your gallery with magnetic wallpaper! If your fridge isn’t big enough to hold the truckload of art that your pint-sized Picasso has created, we have an interesting solution for you! The creative gallery can now break free from the fridge with MagSpace Magnetic Wallpaper. We love this idea even though there’s no denying it’s a budget stretcher at around $128 (£85) per five-metre roll. While wallpapering a whole room using the gorgeous silver and grey geometric print may be a bit much for both the eye and the hip pocket, a feature wall or even a simple DIY job on cupboard doors would look pretty cool and give more space to show off drawings, letters and photos. Be warned, it requires the same application as traditional wallpaper, using paste to apply it to your surfaces. There’s no avoiding a bit of fiddling, but I’m positive the end result will be worth it. 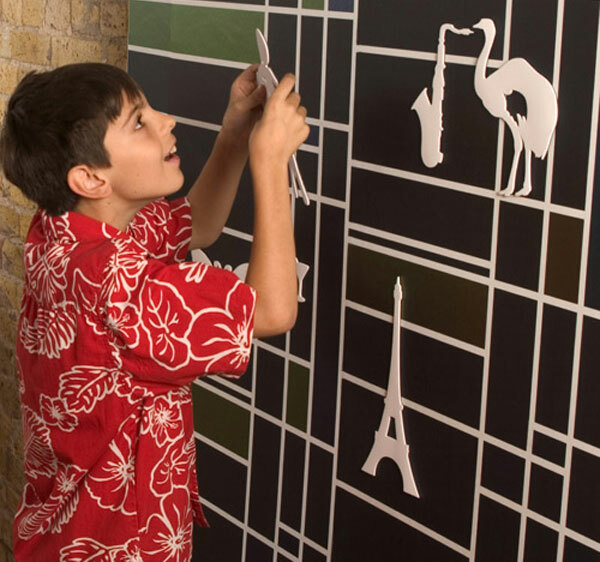 If you are feeling particularly brave, take a peek at the Dry Erase wallpaper – the kids could spend hours creating murals on their playroom walls with a set of whiteboard markers – or for the sake of your stress levels, perhaps stick with the paper and magnets!